To imbue the required cultural centre with a broader urban significance, Blom proposed combining it with dwellings. Elaborating on his notion of a 'living roof' (de Kasbah) he arrived at a new form of housing and planning, the pole dwelling ('paalwoning') and its multiple, 'tree housing'. A pole or tree dwelling, A pole or tree dwelling, later mostly referred to as cube dwelling, consists of a tilted cube with one point anchored in a concrete core containing the entrance and stair. This timber cube consists of three levels: the street-house (kitchen and living room), the sky-house (bedrooms) and the outhouse (balcony or small garden). Sloping walls and unconventional shapes of window force occupants to adopt a creative approach to furnishing, standard furniture and curtains being out of the question. Taking up little room and relinquishing street and garden as such, the plan signifies a radical break with tradition. The cultural centre ('t Speelhuis) was built in 1976, together with a mere 18 dwellings of the projected 183. The building itself, a big cube amidst so many smaller ones, has a large auditorium with foyers and changing rooms on the ground floor and meeting rooms and study areas on the upper level, the stairs being in the concrete cores. The concrete ceilings of the large cube were painted by H. Sanders in an imitation of canvas, giving the auditorium the appearance of a circus tent. 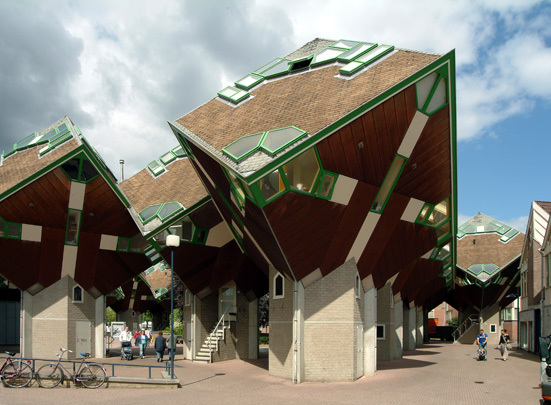 These cube houses and the tree housing concept were repeated in Rotterdam's Blaak Heights to greater applause. The theater was damaged by fire december 2011.